To coincide with the Chalke Valley History Festival, Give a Book are excited to announce our new project… Give a History Book. Our patron, Lady Antonia Fraser, DBE, proposed the idea as a way of spreading the joy of reading history. Antonia Fraser discovered the pleasure of history as a child by reading Our Island Story. She writes about the growth of her own love of the subject in her book My History. Through this designated project we will give history books to our usual recipients – primarily children in deprived areas and prisoners. Book recommendations will be provided by our panel, with historian Dan Snow, biographer Katie Waldegrave and teacher Atalanta Fitzgerald kindly forming the team! 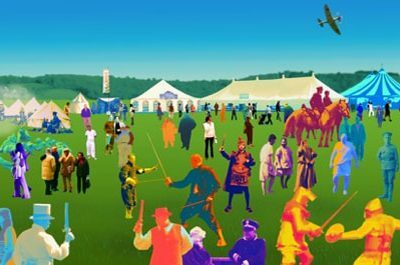 Meanwhile, we are thrilled to be involved with the festival itself, taking place in Broad Chalke, near Salisbury, from 26th June to 2nd July. The week-long festival of discussions, debates, and immersive live events is an impressive feat, and Give a Book are grateful to receive the support of two of the events. On Thursday we will be attending Anne Frank: Her Life and Light by Gillian Perry and on Saturday will be at A Bridge too Far: A Veteran of Arnheim—Staff Sergeant Peter Clarke. See the full programme of events here.